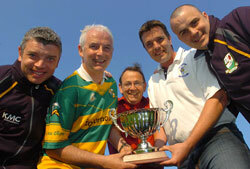 Edendork GAC raises money for The Cormac Trust. Chairman Paul Mallon presents Cormac Trustee Paul Doris with a cheque for £1000, also pictured are John Nelis, event organiser, Declan Cullen PRO and Liam Nelis. 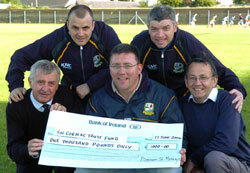 The money was raised through a Past Masters football match against Armagh Harps.Picture Michael Cullen. This entry was posted on Friday, May 19th, 2006 at 11:48 am	and is filed under News/Events. You can follow any responses to this entry through the RSS 2.0 feed. You can leave a response, or trackback from your own site.